Cordless technology has changed rapidly over the last few years. Garden trimming jobs that would have been impossible with a battery-powered trimmer 5 years ago are now dispatched with ease. What Makes A Good Cordless Hedge Trimmer? A modern cordless hedge trimmer can be stored in the shed all winter, and start at the press of a button every time you need it during the warmer months. Although they are generally more expensive to buy than corded electric trimmers, there should be minimal ongoing maintenance, with the added bonus of no extension cords to worry about cutting through, and no need to worry about having an outdoor power point near your hedge. For more about the different types of hedge trimmer, check out our buying guide. 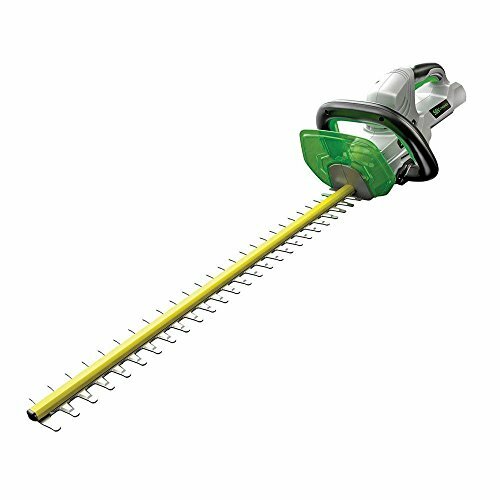 If you need a corded hedge trimmer, have a look at our electric hedge trimmer review. Virtually maintenance-free, and capable of tackling all but the largest hedge trimming jobs, we take a look at the 5 most popular cordless hedge trimmers on the market. This is the best home-use cordless hedge trimmer, in our opinion. We believe it has everything most people will ever need in a hedge trimmer, at a reasonable price. The EGO Power+ HT2400 is, by far, the most convincing electric hedge trimmer ever made, cordless or corded. While the arrival of an electric hedge trimmer that can rival gasoline power has been announced every year for almost as long as I can remember, this is the first one I’ve used that seems to live up to the claim. It’s a beast. It simply cuts through any twigs or branches you can fit into the teeth (anything up to ¾ inch thick) with no fuss, and never seems like it’s going to struggle. Perhaps if you’re a contractor doing large amounts of trimming every day you might need to consider a more powerful hedge trimmer, but honestly for most individuals looking after their own yard, it’s hard to think of a case where this trimmer wouldn’t be good enough. The cutting action is carried out by a 24-inch, dual-action blade, and you can cut up to 3/4" thick branches with it. The EGO HT2400 has the safety features you’d expect in this category, including a mechanism that forces you to hold 2 separate switches down before the trimmer will start, to prevent accidental operation, and a blade brake that stops the blade almost instantly as soon as you let go of the trigger. While this trimmer isn’t the lightest (weighing in at a little over 10lb with the 2.0Ah battery), it is well balanced, and certainly 15-20 minutes of use doesn’t leave me wishing it was lighter. It’s much lighter than a gas-powered hedge trimmer, not to mention the lower vibration & better balance. The 2.0 amp-hour battery supplied with this hedge trimmer takes around 30 minutes to recharge, so if you have another EGO battery, you could keep going indefinitely, stopping only to change a flat battery out for a freshly charged one. You'd be limited by your own endurance, rather than that of the battery. The HT2400 will accept all EGO power tool batteries, though it feels well-balanced with the supplied 2.0Ah battery, and the extra weight of the larger batteries in the range may upset that balance. This is actually an important point – the battery is at one end of the trimmer, and makes up quite a large proportion of the overall weight. In my opinion, the 2.0Ah battery gives you more than enough useful life, but of course your situation may be different. In our opinion the EGO batteries are likely to give you more months and years of service than any other cordless hedge trimmer. EGO use a much more advanced design, and pay more attention to detail with their batteries, than any other manufacturer. We expect this to change over the next few years, as other manufacturers catch up – the lithium-ion battery technology used in these devices is currently changing at a rapid pace. The HT2400 is also available as a bare tool, with no battery or charger (as are most other cordless yard tools) – this can be a great option if you already have other battery powered outdoor tools from the same manufacturer. While the latest generation of battery powered hedge trimmers are more powerful than ever before, they're still not ultimately as powerful as gas powered trimmers. If you have a large area to trim, or a lot of thick branches (thicker than about 3/4"), you should consider a gas trimmer. The limited run-time between charges can be a concern. Hedge trimmers suffer less from this than some other yard tools (you should get an hour between charges with this model), however unless you buy an extra battery and keep it on charge, once you run out of charge you'll have to wait around an hour before you can use the trimmer again. Personally, I've never found I want to keep trimming hedges after an hour, whether I'm using a gas or cordless trimmer! One thing to look out for - if you leave your battery on the charger for more than a month, the charger will automatically drop the charge to 30%. This is done to extend the life of the battery, as being stored long-term fully-charged is terrible for the battery (particularly in hot conditions). All you need to do is take the battery off the charger then put it back on, in about 30 minutes it will be fully charged again. EGO back this hedge trimmer (like all their power tools) with a 5 year warranty on the machine, and 3 years on the batteries. This was previously our #1 choice - however the more advanced battery technology, and class-leading warranty of the EGO trimmer just push the BLACK+DECKER into 2nd place. Similar to the EGO model, this trimmer has a 24-inch dual-action steel blade, creating up to 40% less vibration than traditional single-action blades, and it cuts cleanly and quickly. It has a wrap-around front handle, which is comfortable to hold in all orientations. A soft-feel grip makes this trimmer comfortable to hold while trimming. The handle is large enough to accommodate gloves. The stainless steel blades will stay sharp for many seasons without maintenance. Its lightweight, compact design is easy to use and causes less user fatigue. This trimmer is easy to operate with 1 arm at full extension. The LHT2436 can trim up to 6000 square feet of hedge on a single charge of the battery. It's powered by Black & Decker's 40V Lithium-ion battery system. This offers high power and the versatility to share batteries with other tools within the system. You will also enjoy excellent runtime - up to 1 hour between charges. Black & Decker's 40V Li-Ion system offers many advantages over older 18V and 20V battery technologies. The most noticeable improvement is the ability to put more power into a compact package. Li-ion batteries have a longer lifecycle than earlier NiCad and NiMh technologies. They do not suffer from the memory effect of earlier technologies. They also hold their charge longer when taken off the charger. Once recharged, a Li-ion battery is always ready to use. The battery pack has a built-in power level indicator. A push button shows power remaining with 4 coloured LEDs. The plug-in desk-top charger is simple to use. A flashing green LED tells you it is charging. When charging is complete, the light stops flashing. There is no need to remove the battery from the charger until you need it. Black & Decker back this trimmer with a 3 year warranty. 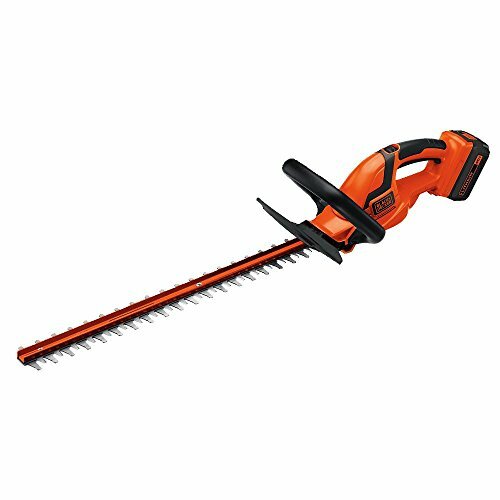 The WORX WG291 is another extremely capable 56V cordless hedge trimmer. The WORX WG291 is, like our #1 choice, powered by a 56V battery, which is interchangeable with other tools in the WORX range. To be honest, a lot of the time, the decision about which manufacturer’s tool to buy will depend on whether you have already invested in another cordless tool from the same range – if you can share 1 or 2 existing batteries and a charger between 2, 3 or more tools, it maybe doesn’t make a lot of sense to pick and choose different tools from each manufacturer. The WORX trimmer is heavier than the EGO, and feels more unwieldy. This is likely to become an issue the longer you expect to use the trimmer – if it’s just a few shrubs it’s unlikely to be an issue, if it’s 100 feet of tall hedge, you’ll definitely be tired sooner using the WORX trimmer than the EGO. EGO has the best battery technology of any cordless yard tool manufacturer we’re aware of at the time of writing (March 2018). Some users have reported the WORX blade becoming blunt sooner than expected; this depends on the amount and type of cutting you’re using it for, and is very difficult to compare to other trimmers exactly, as each trimming job will be different. All in all, we wouldn’t be unhappy with the WORX trimmer – the power, battery life between charges, ultimate cutting ability etc. is on par with the EGO, however in this case the overall product just isn't quite as good. You get a 2-year warranty with this trimmer, which is automatically extended to 3 years if you register your trimmer with WORX. 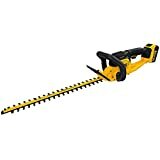 The DeWalt DCHT820P1﻿ 20V MAX Hedge Trimmer has a powerful motor and a laser cut, hardened steel 22” blade with dual action. It is designed to cut on branches up to ¾” thick. The trimmer is compact and light at 7.5 lb, for maximum manoeuvrability and minimum stress on the operator. This model is less than half the weight of the 40V DeWalt equivalent. This cordless hedge trimmer has a wrap-around auxiliary handle, giving you a comfortable grip. The power switch has a safety lock-off feature. This unit includes a high capacity 20V, 5Ah Li-Ion battery with ample power to get your trimming work completed. The included charger will recharge your battery in around 3 hours. If you have other DeWalt 20V MAX tools, the batteries are interchangeable. The DCHT820P1 (20V) and the DCHT820M1 (40V) have very similar specifications, with the obvious exception of the battery voltage. The 40V model has an extra handle at the rear, where the battery is on the 20V model. However, the 40V trimmer is significantly heavier. The 40V trimmer is usually more expensive, though prices do change all the time. You would expect the 20V battery to provide either less performance or less run-time than the 40V model, however customer reviews suggest similar run times for either power source. Battery life between charges for any hedge trimmer will be very dependent on the thickness & toughness of the branches you’re cutting, so it will not be the same for any 2 users. User feedback suggests the 20V DeWalt trimmer punches above its weight. DeWalt provides a 3 year warranty. The Makita XHU02Z is a great product from a respected brand, though a bit underpowered in this company. 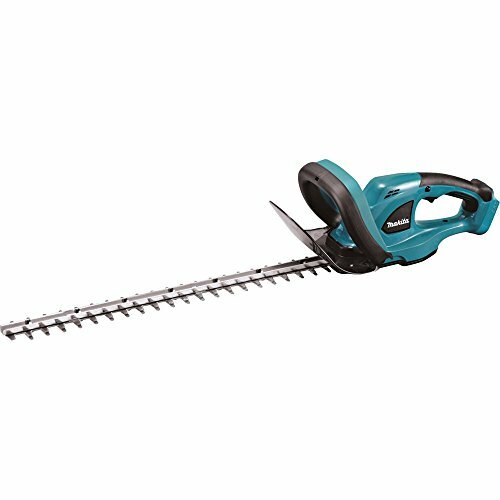 The Makita 18V LXT Lithium-Ion Cordless Hedge Trimmer is a powerful tool, with an ergonomic design. The design incorporates internal damping cushions. This reduces vibration, making it more comfortable to use for long periods. It features a soft-touch grip design. Lightweight at only 7.4lbs, but equipped with a 22” steel blade, using this trimmer you can cut through ¼” thick branches with ease. Makita have also addressed noise levels. At 87dB(A) ear protection is still recommended, but it’s up to 25% quieter than some other cordless trimmers. A built-in battery capacity warning lets you know when it’s time to recharge. Makita claim up to 75 minutes of run time on a single charge. For safety reasons, the motor will only switch on when you have both hands on the handles. Changing the blade is fast and easy, with no tools required. Makita backs this trimmer with a 3 year warranty. Disappointing cut capacity - only 1/4"
The longer your hedge trimmer can run between charges, the faster you'll have your garden looking neat. Older trimmers may only be capable of 20 minutes between re-charges - more modern versions can give you up to an hour, possibly even a little longer. Electric motors consume electrical power, measures in watts (not Volts, Amps or anything else). Batteries are generally rated in Volts and Amp-hours. If you multiply the voltage (e.g. 56 for the EGO) times the Amp-hour rating (e.g. 2.0 for the battery supplied with the EGO trimmer), you get 112 watt-hours (meaning a sustained 112-watt output for 1 hour). If you decide on a different trimmer, with a different battery rating, do the same calculation for your selected model. If it comes to around 55 watt-hours, you'd expect to get around 30 minutes between recharges. Unfortunately it's difficult for anyone to put an exact number on how long the battery will last between charges, as it's so dependent on what you're cutting through. If you were to cut through thick, old-growth branches, as wide as can fit into the trimmer's blades, your motor would be working a lot harder than if you were cutting through thin, new growth, so you'd expect the battery to lose it's charge faster. Only a few years ago, you could only expect about 15-20 minutes of run time from your battery, and it could take several hours to fully recharge it. So if you had an hour's worth of hedges to trim, it could potentially be an all-day task. Nowadays, some trimmers can last over an hour between charges, and their intelligent chargers may only take 30 minutes to recharge. If you buy one of the better trimmers available today, charging time isn't really a concern. If you buy an older or cheaper model, this may still be a concern. There is a trade-off here: the more powerful batteries and motors, featured in the latest hedge trimmers, can add quite a bit of weight. It's noticeable with the EGO trimmer compared to last year's #1 pick (the LHT2436), and all the extra weight of the EGO model feels like it's in the battery. That said, a slightly-heavier trimmer, if it's well balanced, can be easier to operate for long periods than a lighter trimmer that isn't so well balanced. The longer the blade, the more you can cut with one pass, so you can either cut more in the same amount of time, or have your trimming job finished sooner. The main disadvantage of a longer blade is if you're trying to trim delicate patterns, or very small bushes & hedges. Depending on how thick & tough your shrubbery is, you may need to consider the tooth gap (the largest-sized branch that will fit between 2 teeth on the blade). The best cordless hedge trimmers have a ¾” gap, however some of the smaller & cheaper trimmers have a smaller gap. Make sure the trimmer you buy is capable of cutting what you need it to! Longer is better (obviously). Check the fine print for conditions attached to the warranty, e.g. would you have to return the trimmer to a distant service location if it broke down? Would the maker repair or replace it? Protect your investment to ensure it lasts as long as possible. The EGO HT2400 is the best overall choice in our opinion. It has all of the extra power of the 56V system, coupled with better battery technology and a better warranty than the Black+Decker LHT2436, which comes a close second. Do you own any of these hedge trimmers? Did you choose a different model? Let us know in the comments below.